This school year, I embarked on a new part of my career: I am the Blended Learning Specialist at my school. This is just a fancy way of saying I am a tech coach. Part of my responsibility is to provide enriching and targeted professional development to my school’s staff. I needed to find a way to engage my teachers without being too much of a burden on their time and energy, and also to make sure I am providing professional development that fits the needs of my staff. Last spring, I started researching digital badges and the ideas of gamification, but couldn’t figure out how to implement this into my classroom. I tried out multiple platforms and styles of gamification and digital badges before landing on BadgeList. I first tried out BadgeList at annual CUE conference, and started by earning a few of the conference participation badges. BadgeList is by far the most simple and straightforward platform I found, and they are constantly making improvements. The premise is simple: design badges with specific criteria (evidence) for earning, invite learners, then encourage users to earn badges. Your learners can submit a variety of types of evidence, including text, image, link, tweet, and code. This allows for flexibility in the methods of submitting evidence, but limits to keep it relatively simple. When I am starting a learning group, I always go through the following planning steps. 1. I decide on my purpose and audience. What do I want my learners to learn, and who will join my group? 2. I create a document to keep track of my badges and learning criteria. I include a badge number, the name, the finished image, and the badge description. Here is the template you can use to plan out your learning group. 3. Finally, I design my badges using Google Draw. Here is a template you can start with! BadgeList also gives you the option to customized badges from templates too. Many of the teachers at my school have hopped on board with BadgeList, and are excited to try new badges. This motivates our learners to try out new tech tools in bite-sized chunks, one tool at a time. What is great about BadgeList is that we can see who is an expert in a certain tool, and then go to that person for questions or extra help, rather than waiting on an organized training. I created a BadgeList group for teachers at my school, and due to popular demand on Twitter, I created a duplicate group called Getting Techy that anyone is welcome to join. Feel free to join this, use my ideas, and give BadgeList a try! Problem: Two of my three science classes are participating in a field trial with the Lawrence Hall of Science (Berkeley, CA), and were a week and a half behind my other science class. I’m out for 2/3 science days next week, and want my kids back on the same lessons for my own sanity (and for the sanity of writing sub plans). My limited knowledge comes from Mr. Justin Birckbichler, my EduRoadTrip co-host and #FlyHighFri co-creator. He has two blog posts on green screen, his blog and the CUE blog. Both of these posts help me figure out the basics of green screen, and envision an idea for the workflow for the class. We are 1:1 iPads, and I used DoInk ($2.99), but since it’s a paid app I bought it on my iPad only; the App Store is closed down to students, and I can only request free apps to be pushed to their devices. I purchased green fabric at Hobby Lobby (2 cuts, 2.25 yards each). I had a hard time figuring out the workflow, and still didn’t have a clear handle on it until we actually recorded! 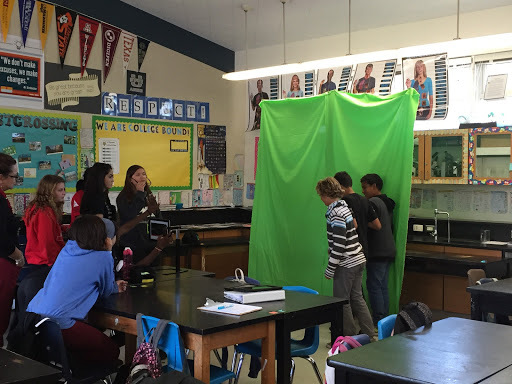 I introduced it to my students with a warm-up question, “What makes Magic School Bus magical?” We discussed, and then I told them we were going to try out green screen–they were giddy with excitement. Their anticipation grew even more when I told them I had never done this before, and we were going to learn together. The premise of their project was to form groups of 3 and create a 2-3 minute video where they creatively explain a chemical reaction. Then, their first task was to collaborate on a script on Google Docs. 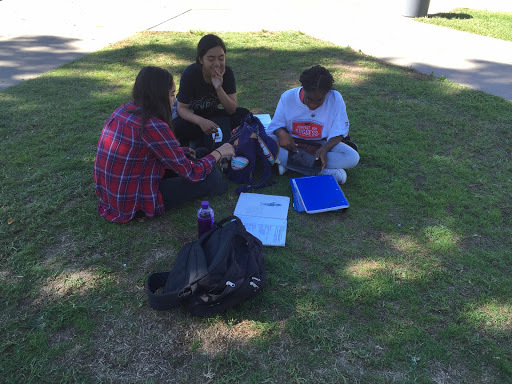 We spent the rest of the block period (105 minutes) outside writing scripts on the grass and on benches. The next block we were on a field trip (yay!) and students finished their script on Friday (30 minutes). On Monday, I projected the workflow (see below), and students worked either inside or outside in their groups for 105 minutes. I had two groups record on Monday, which was a huge success because we learned how to use the DoInk app together! On Wednesday, I had 8 groups that needed to record, so I assigned them each a “call time” for 10 minutes of recording time and sent everyone else to practice outside. For this first time using green screen, I limited my students to one background to keep things simple. In the future, I’ll allow them to record with multiple scenes. My two groups that already recorded had also edited outside of class. I asked these 6 girls to manage the recording process using my iPad. Something amazing happened: they took over the entire recording process, including downloading the image from Google Drive, using the app, directing the recordings, managing props, uploading the video, and alerting the next group it was their time. I was amazed that they took on this leadership without being asked! And, it freed me up to check in with other groups and not stress about getting everything done. Once students recorded, they downloaded their video from Google Drive and edited on iMovie. I will have my students turn in their finished videos on Friday. I know I not giving them enough time to edit to create amazing finished products, but we simply do not have time since I’ll be out on Monday and Thursday next week. In the future, I’ll build in some more editing time at the end. In all, this project took 2 blocks and 2 Fridays, approximately 250 minutes. Our whole class was excited about this project, and we can’t wait to do it again next semester!